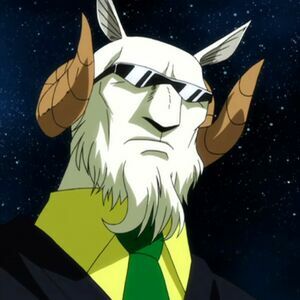 Appearance: Capricorn is a tall humanoid, towering over all of his fellow guild mates, who possesses many goat-like traits: his body is covered in short, brownish white fur with longer tufts covering his lower face, resembling a goatee, and the back of his legs which greatly resemble those of a goat, being slightly bent backwards and ending in dark hooves. He has short, thin ears sitting on top of his head, with a distinctive, elongated oval form, and horns which curve downwards and jut frontwards framing his face. From his lower back sprouts a mildly long tail ending in a dark tuft of fur, and his fingers sport long and dark nails (highly reminiscent of claws). His elongated face possesses marked cheekbones and a prominent, large nose; his eyes are always hidden away by a pair of black, mirror polished shades with the lenses fusing into a single one, possessing a hollowed part in order for them to rest on Capricorn’s nose. Capricorn possesses prominent, toned abdominal, and, while initially portrayed as lean-built. Personality: Capricorn is a rather calm individual but is able to show emotion. He is quite loyal to his summoners especially those that earn his respect. He is also very respectful as he calls everybody with the honorific "-sama". He also seems to appreciate the idea that Magic is based off of love. In addition, Capricorn is highly skilled in teaching others about Magic having a large knowledge base regarding how to increase ones magical power and knowledge on other magic's.